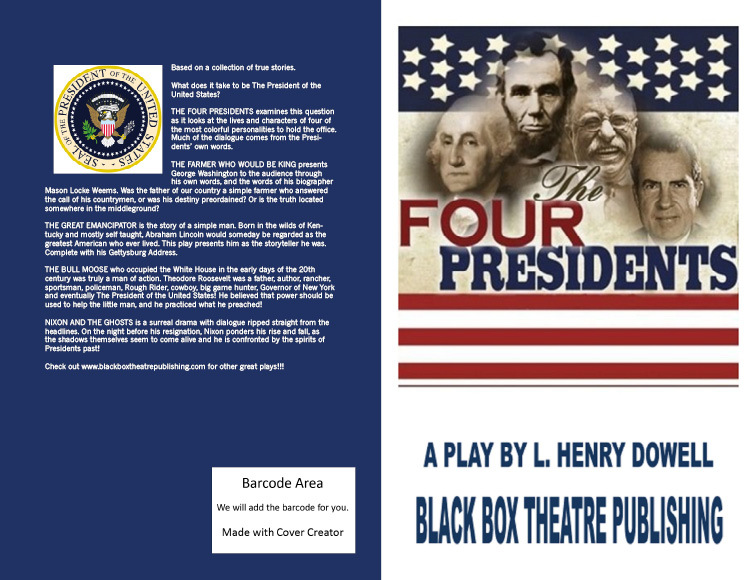 Black Box Theatre Publishing Company - The Four Presidents An excellent educational piece based upon a collection of true stories. What does it take to be The President of the United States? What kind of person? 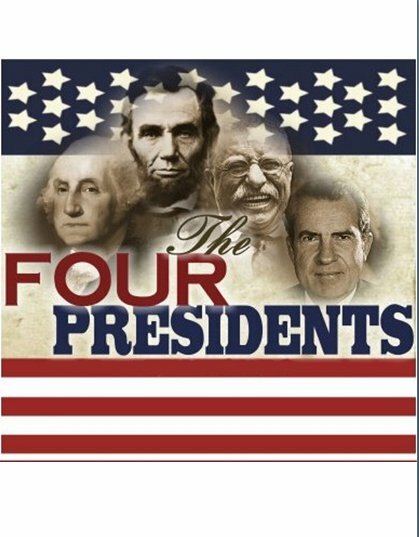 THE FOUR PRESIDENTS examines these questions as it looks at the lives and characters of four of the most colorful personalities to hold the office. Much of the dialogue comes from the presidents' own words. THE FARMER WHO WOULD BE KING presents George Washington to the audience through his own words, and the words of his biographer Mason Locke Weems. Was the father of our country a simple farmer who answered the call of his countrymen, or was his destiny preordained? Or is the truth located somewhere in the middle ground? THE GREAT EMANCIPATOR is the story of a simple man. 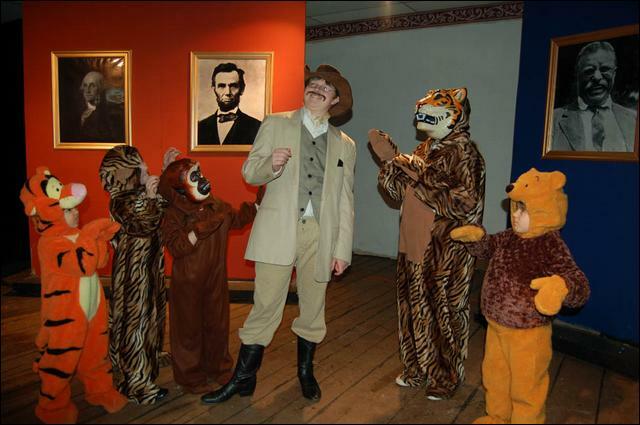 Born in the wilds of Kentucky and mostly self taught, Abraham Lincoln would someday be regarded as the greatest American who ever lived. This play presents him as the storyteller he was. Complete with his Gettysburg Address. THE BULL MOOSE who occupied the White House 100 years ago was truly a man of action. Theodore Roosevelt was a father, author, rancher, sportsman, policeman, Rough Rider, cowboy, big game hunter, Governor of New York and eventually The President of the United States! He believed that power should be used to help the little man, and he practiced what he preached! NIXON AND THE GHOSTS is a surreal drama with dialogue ripped straight from the headlines. On the night before his resignation, Nixon ponders his rise and fall, as the shadows themselves seem to come alive and he is confronted by the spirits of presidents past! Cast Size: 10+ roles with doubling possible.Running Time: 60 minutes. Royalty: $50.00 per performance. Apply here.﻿Click here to order scripts directly from us. ﻿﻿ Click here to order through Amazon.Appropriate for all audiences. An excellent educational piece based upon a collection of true stories. What does it take to be The President of the United States? What kind of person? THE FOUR PRESIDENTS examines these questions as it looks at the lives and characters of four of the most colorful personalities to hold the office. Much of the dialogue comes from the presidents' own words. THE FARMER WHO WOULD BE KING presents George Washington to the audience through his own words, and the words of his biographer Mason Locke Weems. Was the father of our country a simple farmer who answered the call of his countrymen, or was his destiny preordained? Or is the truth located somewhere in the middle ground? THE GREAT EMANCIPATOR is the story of a simple man. Born in the wilds of Kentucky and mostly self taught, Abraham Lincoln would someday be regarded as the greatest American who ever lived. This play presents him as the storyteller he was. Complete with his Gettysburg Address. THE BULL MOOSE who occupied the White House 100 years ago was truly a man of action. Theodore Roosevelt was a father, author, rancher, sportsman, policeman, Rough Rider, cowboy, big game hunter, Governor of New York and eventually The President of the United States! He believed that power should be used to help the little man, and he practiced what he preached! NIXON AND THE GHOSTS is a surreal drama with dialogue ripped straight from the headlines. On the night before his resignation, Nixon ponders his rise and fall, as the shadows themselves seem to come alive and he is confronted by the spirits of presidents past! Cast Size: 10+ roles with doubling possible.